As if there were a need for even more evidence that global warming is a real, verifiable and evidenced threat, new research is showing Central and South American coffee production is drastically dropping because of higher global temperatures. Add extreme rainfall totals to the mix and the result is rampant insects and damaged plants. If economics won’t convince people the earth is warming, perhaps interrupting their coffee supply will. 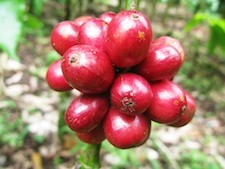 A traditionally reliable and adequate income, coffee farming is becoming a more challenging option. Where entire communities once depended on coffee to perpetuate their economies, farming families need to find alternative sources of income. Last year, production dropped 70%. A fungus called Coffee Rust is killing of coffee plants quickly where lower temperatures once prevented the spread of the fungus. If ever there was a clear connection between global warming and the declining of production and community stability. Beans from the area that is seeing the most dramatic trouble produce 16% of Columbian coffee, and command high prices in specialty coffees. Don’t think that insulates you generic brand coffee drinkers. The entire supply chain is cross-polinated (no pun intended) and will result in higher prices across the spectrum of quality. Growers are doing their best to respond with specially bred plants that are slightly more resistent to the effects of climate change. That being said, how much do we need to genetically modify our plants before we simply choose to change our consumption habits before we reach the tipping point of global warming from which there is no return. Because the 91,000 Columbian families that grow coffee sell as part of cooperatives, their livelihood is at the whim of buyers as prices fluctuate based on supply. That translates to fewer profits for growers and more greenbacks leaving consumer wallets to buy the ever-addicted brown gold.